Interested in Management, HRM, Logistics and Business? Launch your career with a business degree from UniSA. Ranked in the top one per cent worldwide1 and awarded an overall five stars for excellence2, the UniSA Business School will prepare you to graduate career-ready with the latest business skills and knowledge. Our highly-flexible business and management degrees provide you with a solid foundation of contemporary management theory and its practical application, enabling you to achieve business objectives in a broad range of organisational contexts. You'll graduate as a critical thinker and an informed decision maker, fully-prepared to manage emerging issues within today's dynamic global business environment. Modern managers are skilled problem solvers – they organise people, manage money and leverage technology to achieve business objectives. They are at the forefront of business. This degree will provide you with a grounding in key business disciplines through industry and business-focused courses, providing you with the expertise to manage resources and projects in a global business environment. Effective human resource management practice requires expertise in the operation and management of business. Recognised by the world’s largest human resource professional society3, our HRM degrees provide you with the knowledge and skills required for professional practice as a human resource management specialist or leader. Designed and taught by experts actively involved in industry collaborative research, you'll gain a comprehensive understanding of the broader business environment. As supply chains lengthen and globalised business broadens, skilled leaders with specialist skills are in high demand industry-wide. Our specialised degrees will provide you with skills to manage the flow of goods and services from point of origin to consumer, focusing on the complex system of global supply that delivers products to your doorstep or local retailer. As a graduate, you will be an innovator – able to recognise the need for change in the supply chain, in both local and international markets. You can also choose to specialise in a range of business areas including innovation and entrepreneurship, international business and more. 1UniSA Business School is one of just nine institutions in Australia and 180 globally to be accredited by EQUIS (from over 16,500 worldwide). EFMD, February 2019. 22018 QS Stars Ratings. 3Recognised by the world’s largest HRM body, based in the United States – the Society for Human Resource Management (SHRM). Study at the No.1 Business School in South Australia for graduate careers2. Learn from researchers recognised as above world standard in Business and Management3. Choose from specialisations in areas such as management, human resource management, logistics and supply chain management, innovation and entrepreneurship, and international business. Take intensives and fast track your degree in summer or winter school. 1UniSA Business School is one of just nine institutions in Australia and 180 globally to be accredited by EQUIS (from over 16,500 worldwide). EFMD, February 2019. 2QILT: Graduate Outcomes Survey 2016-18 – Full-time Employment Indicator (Undergraduate). Public SA-founded universities only. 32015 Excellence in Research for Australia (ERA). 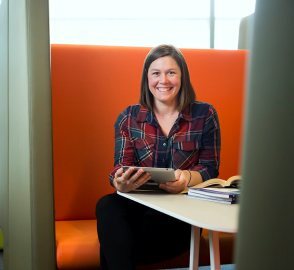 Our strong real-world connections mean you will learn from researchers recognised as performing above world standard in Business and Management2. 1QILT: Graduate Outcomes Survey 2016-18 – Full-time Employment Indicator (Undergraduate). Public SA-founded universities only. 22015 Excellence in for Research Australia (ERA). 3UniSA Business School is one of just nine institutions in Australia and 180 globally to be accredited by EQUIS (from over 16,500 worldwide). EFMD, February 2019. A more human HR degree. Study the Bachelor of Business (Human Resource Management) on demand with UniSA Online. A 100% online degree designed specifically for online learning. 1QILT: Graduate Outcomes Survey 2016-18 – Full-time Employment Indicator (Undergraduate). Public SA-founded universities only. We are a globally connected university, our staff and students come from over 90 countries. We have more than 2,500 industry and professional relationships that support student internships, research and community engagement. Our Business School works with more than 200 companies, governments and organisations, and many of these are long-standing relationships built on common goals and shared values. In the 2015 Excellence in Research for Australia (ERA) rankings, all our research in business and management was assessed as above world-class. We have strong links, individually and collectively, with leading and like-minded research institutions in North America, Europe and the UK and are building equally exciting new relationships in Asia. At the UniSA Business School, you'll learn invaluable transferrable employability skills to future-proof your career. Hear from industry leaders, students and graduates as they discuss the importance of these skills in the workplace. When I commenced my studies, I was already working full-time in the Defence industry as both an engineer and a manager. I have been able to use my ongoing employment as context for learning and immediately put into practise the theory that I have learnt. The Master of Management was fundamental in preparing me to pursue career opportunities. I am now prepared to approach my current and future work opportunities with open eyes. After working in the manufacturing industry for 11 years, I decided to embark on a career change and study human resource management at the UniSA Business School. The diversity of the degree has allowed me to gain confidence and provided the opportunity to attend networking events with the Australian Human Resource Institute - I've been able to have interesting conversations and learn from other students and Human Resource practitioners. I knew of the Business School’s high ranking and the Logistics and Supply Chain Management program was ideal for the type of career opportunities I was interested in. Throughout my studies, I’ve been able to gain valuable insights and advice from experienced industry professionals through the Business Career Mentor Program which has definitely assisted me with both self-development and skill building opportunities.